Las Kellies is an Argentinian band that plays a mix of raw garage and post-punk playground chants. They released their new album Total Exposure last month and are currently touring Europe. They sent us some of their tour photos. The pizza moment: it was our first proper Italian pizza in Italy! So, it’s a big deal, if you think almost all our people come from Italian immigration. Pizza in Buenos Aires is a common meal, we are really fans! But in BsAs, the shape and taste is nothing similar to the pizza roots! About the cleaning window, that’s our van Vito! After a lot of hours of driving, and getting bored, it’s nice to clean the insect bodies from the window! We take care of our van, because it’s like our home! On October 5th Las Kellies play OCCII in Amsterdam. See their website for more tourdates. Las Kellies is een Argentijnse band die een mix speelt van rauwe garage met post-punkachtige leuzen. Afgelopen maand kwam hun album Total Exposure uit en momenteel touren ze door Europa. 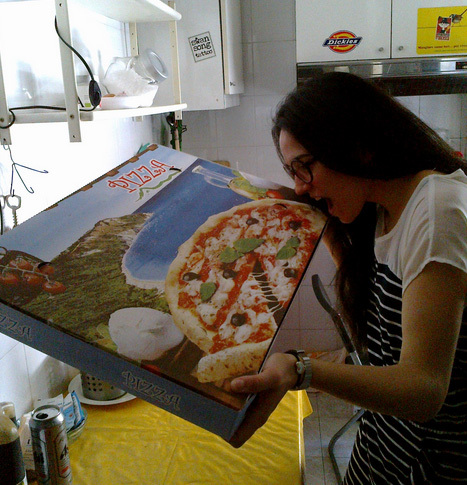 Ze stuurden ons een paar van hun tourfoto’s: The pizza moment: it was our first proper Italian pizza in Italy! Op 5 0ktober speelt Las Kellies in OCCII in Amsterdam. Zie hun website voor meer tourdata.